Parks and pools add to Stapleton’s position as one of Denver’s kid friendly neighborhoods. Stapleton is home to 50 green spaces and parks, including Central Park, the third largest park in Denver. Stapleton also boasts six different outdoor pools that provide lessons, swim teams and a place to relax and cool off. There is an indoor pool in the neighborhood recreation center. Free community activities abound in Stapleton. Summer events include outdoor movies, theater productions, concerts and farmer’s markets. You’ll also find unique outdoor destinations including the Urban Farm that cultivates “kids, crops, critters and community” and Bluff Lake Nature Center, an urban wildlife sanctuary. Another of Denver kid friendly neighborhoods is Washington Park. Often called “Wash Park,” the heart of this neighborhood is, of course, the park. There you will find two playgrounds, biking paths and lakes for fishing, paddle boating, and other water sports. Additionally, there is a recreation center offering swimming and classes and activities for everyone in the family. For schools, SchoolDigger says Lincoln Elementary School ranks better than 90.7% of elementary schools in Colorado and is 14th among 100 ranked elementary schools in Denver. Steele Elementary is ranked as the 50th best school out of 924 in Colorado. Montessori School of Washington Park is a popular preschool among residents. Congress Park, another of the Denver kid friendly neighborhoods is minutes from Denver’s newest recreation center: Carla Madison Recreation Center. There you will find a pool with two diving boards, play features, a waterslide and lazy river that will give the kids hours of enjoyment. Along with a traditional curriculum, neighborhood school Teller Elementary is a gifted and talented magnet school for students age 4 to fifth grade who are identified as highly gifted and talented. The school added a math acceleration program in 2017. Good Shepard Catholic School is a high performing private school option. Offering courses and private lessons, Children’s Music Academy is a great neighborhood resource. Children’s Music Academy seeks to improve children’s reasoning skills for greater success in math and science and develop social and emotional skills. 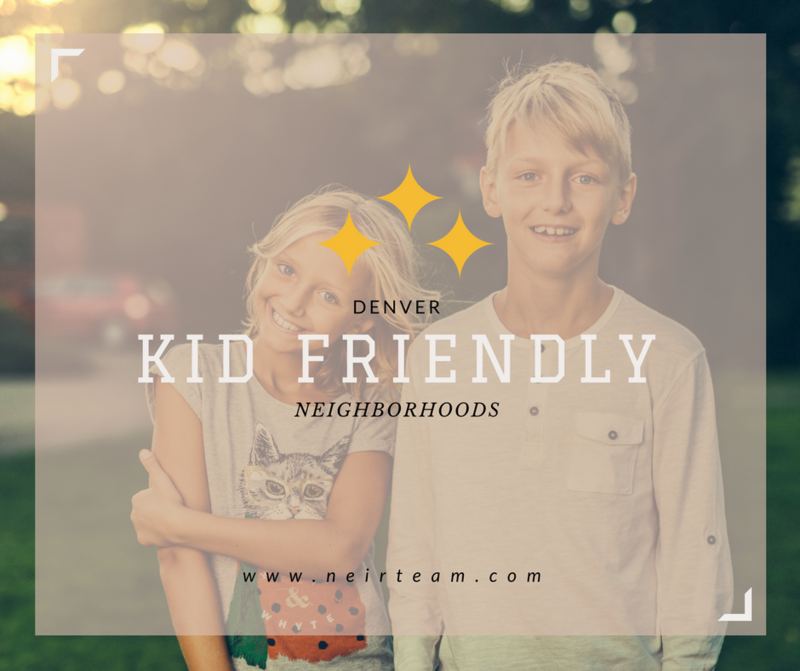 Cherry Creek and Hilltop: Public schools serving these Denver kid friendly neighborhoods include Bromwell, Steck, and Carson. All three schools are recognized by GreatSchools as having test scores far above the state average suggesting that most students at these schools are performing at or above grade level. Steck is also the top-rated school in the entire Denver Public School District. Bromwell has been recognized by the U.S. Department of Education as a National Blue Ribbon School, which recognizes academic excellence, among other factors. Hilltop also hosts Graland Country Day School as a private option for preschool through middle school. A fun destination for families with younger children is the dinosaur-themed play area inside Cherry Creek Shopping Center and Great Play of Cherry Creek, an award-winning gym for kids 1-10.